By using this website, you (the user), accept this disclaimer in full. If you disagree with any part of this disclaimer, do not use this website. MyVintageBarbies reserves the right to modify these terms at any time. All content on this website, including photographs, text, and designs, are the property of the owner of this website and is provided for personal, non-commercial use only. No part of this website may be reproduced in any form or by any electronic means without my written permission. This is a reference website, and MyVintageBarbies believes the written information to be true and accurate, although the owner of this site does not guarantee the validity of the information provided. Most photographs are from the owners personal collection, and the information came from her many years of collecting and hours of research. All trademarks, brands, etc. are the property of their respective owners, who may not be affiliated with this website but are mentioned for informational purposes only. The owner of MyVintageBarbies and this website are not affiliated with Mattel, Inc. in any way. This website is not responsible for the content or reliability of any other website to which we have provided a link. This website does have affiliate agreements with other companies (such as eBay Inc. and Amazon.com, Inc.) and does refer and promote their products on this website. Products are not sold directly from this website. When you click through to buy products I may earn a very small compensation. 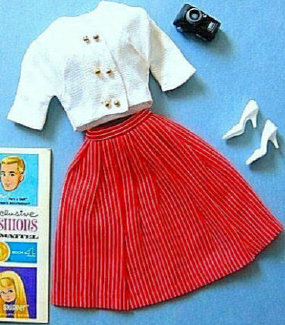 Your purchase helps keep My Vintage Barbies up to date for my readers, which I very much appreciate. By sharing any contribution (including photographs, text, video, audio and graphics) with the website or the owner of this website, you agree to grant, free of charge, permission to use the material in any way we see fit, any content you provide is your own original work, and does not infringe on any U.S. laws, and you have the right to give us permission to use if for the purposes specified above. You (the user) must not use this website in any way which is unlawful, illegal, fraudulent, harmful, or in connection with any unlawful, illegal, fraudulent or harmful purpose or activity. Any content posted by users and the views expressed are theirs and unless specifically stated are not those of MyVintageBarbies. We accept no responsibility for any loss or harm incurred. You (the user) assumes all risks associated with the use of this website, including damages to you (the user), or your computer by virus, bugs, or any file that is transmitted. We cannot warrant that the server that makes it available to the user is free of viruses or bugs. You acknowledge that it is your responsibility to implement sufficient procedures to safeguard your computer (including anti-virus software, and any other security measures you so desire). MyVintageBarbies and the owner of this website shall not be liable for any damage caused in part, or in whole by the user’s action or decision in using this website. This Agreement is governed by the laws of the State of Oregon, USA. User consents to the exclusive jurisdiction and venue of the Circuit Court of the State of Oregon for Lane County, and the Federal District Court for the District of Oregon, USA in all disputes arising out of or relating to the use of this website.